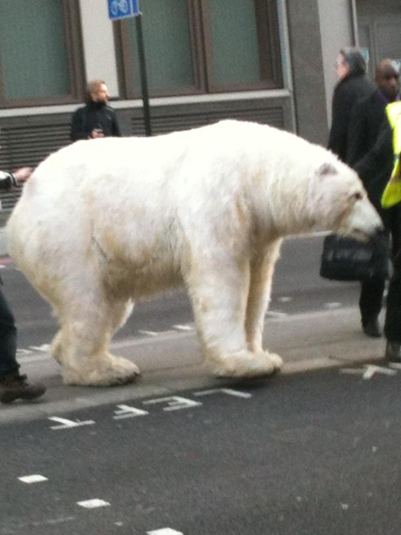 Not only was there a tank making the rounds in London last week (read about the campaign here) but many took to Twitter on Friday morning posting pictures of a seemingly lost Polar Bear wandering down Lower Thames street. 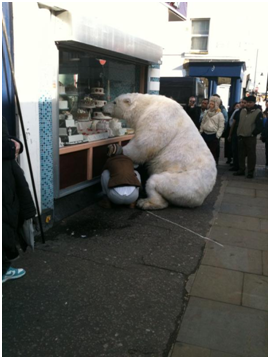 It was unclear at first why the bear was making its way down the busy London Street, but it soon became clear that the lifelike Polar Bear was in fact two poor individuals in a costume (I certainly don’t envy the one at the back!). The stunt failed to generate much media coverage despite being pitched outside the Northern and Shell building which is home to the Express Group and Channel 5, but it certainly seemed to have a strong message to send out. Nevertheless, with Twitter what it is these days many people took to posting pictures of the out of place mammal online and attributed the stunt to Greenpeace UK. The campaigners then retweeted the pictures of the bear which has been apparently named Paula. The stunt was part of a campaign run by Greenpeace UK to protest against Shell drilling in the Arctic. A film crew were filming a short online film including the bear at a Shell garage in Barking on Thursday which will be available to watch in a few months time.